For those that doubt that 200 students can work towards a common goal, under pressure and with limited resources, this year’s architecture freshmen have shown that it can be done. 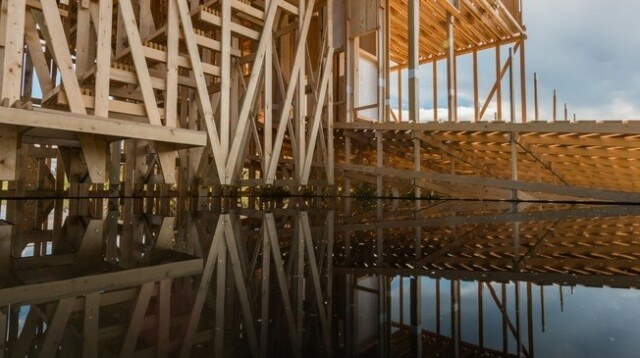 The proof is an impressive three-dimensional pavilion, roughly 10 meters across in each direction, made up of approximately 2000 wooden beams. Within the structure, twelve architectural installations invite visitors to experience a variety of sensations as they climb narrow staircases and collapsible ladders from one installation to the next. The structure, located to the east of the Rolex Learning Center, will open several times this summer, to be admired from afar and from within. The structure’s raison d’être is as a teaching platform for first-year architecture students. Working in twelve design studios, the students first teamed up in pairs to propose projects for rooms that could be integrated into the latticework of the underlying protostructure. The one hundred proposals to emerge were then whittled down to a dozen, one per design studio. These were then further refined and combined into a coherent whole. The spaces in the pavilion include a theatre that can be viewed from outside the structure, from a balcony within it, and even from a zenithal viewpoint one floor further up. A series of stairs and ladders take visitors to the lung – a module on the second floor that channels air from its windows through a corridor draped with white fabric – and from there, up to a vertiginous lookout directs the view towards the eastern end of Lake Geneva and the mountains beyond. To carry out the project, ALICE teamed up with external engineer Rémy Maylan and several sponosrs from the industry. For the students it was a unique, and in many ways eye opening, experience. “It is very rare for students to work on a full-scale prototype so early on into their curriculum and interact with a civil engineer to ensure that their designs are structurally sound,” says Mignon. But with so much to learn, she says, they were always ready to go the extra mile. “I was constantly impressed by the energy they were willing to put into making this project work,” she says.